The Sugar Bowl Academy is nestled in a quaint European-style ski village at the base of Sugar Bowl ski resort is recognized for nurturing that talent while providing top level academics. Situated just steps from the Sugar Bowl Academy, this newly built mountain modern-designed home is being offered with one year of tuition to the Academy – a $35,000 value. Sugar Bowl Academy is the only school in California to focus its sports program entirely on skiing – downhill, Nordic and freeride. The benefits of having a ski academy in your backyard sets Sugar Bowl apart during their search for the perfect mountain home and lifestyle. There are about 20 similar ski academies across the U.S. in Colorado, Idaho, Utah and on the East Coast. “Sugar Bowl Academy is unique among ski academies in that it is located right on the mountain, allowing for training and school to integrate, and for immersion in the full mountain lifestyle,” said Sidney Scott, a Sugar Bowl homeowner and parent of SBA students. For those seeking a similar experience, look no further than 790 Twinberry, located in the heart of Sugar Bowl’s trailside village. Situated just steps from the Sugar Bowl Academy, this newly built mountain modern-designed home is being offered with one year of tuition to the Academy – a $35,000 value. “The home is designed to maximize all that Sugar Bowl has to offer,” Scott said. The coveted central village location offers convenient proximity to the Sporthaus, to Sugar Bowl Academy, and to year-round parking, a perk that can’t be found with most Sugar Bowl homes in the winter. Other features include sunny exposure, an open floor plan and big panoramic views of all the major peaks. 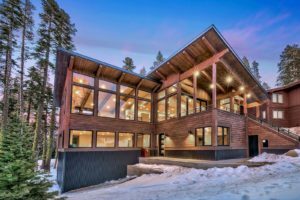 Extra storage for all the winter and summer toys completes this home for families pursuing a college prep/ski academy experience or for those who simply seek a slower paced mountain lifestyle. The village itself is designed for those seeking true mountain charm. “Sugar Bowl offers an authenticity that you won’t find in many of the mountain communities where the connection to nature feels more and more ‘manufactured,’” Hamilton said. In the winter, the streets are transformed into cross country ski trails with no automobile access. Cars are left behind as homeowners are transported to their upscale residence via a comfortable, heated snow cat. In summer, homeowners have front-door access to miles of hiking and biking trails with bursts of wildflowers decorating the hillsides and meadows. Trails also connect to Sugar Bowl’s private Lake Mary, an oasis for swimming, paddle boarding, boating and fishing. 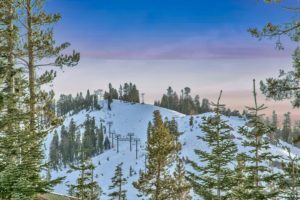 Scenic Sugar Bowl ski resort in the Lake Tahoe area has a history dating back to the late 1930s. Amenities include private homeowner events, express line privileges and 24-hour VIP village services, such as grocery delivery and house warming prior to a homeowner’s arrival. Owners and SBA students share access to the Sporthaus, which includes a pool, spa, sauna, steam rooms, world-class training and fitness facilities, massage rooms and yoga classes. For more details, contact Hamilton at jhamilton@sothebysrealty.com or call 530 412-1477.